SummerChasers Stories: Away we go again! No matter, January follows December and by golly, we're going to skip most of it! New Year's Eve in Hong Kong. Jan 1-8 in Cambodia, split between Phnom Penh and Siem Reap. Jan.9-12 float down the Mekong to Saigon on a private boat that Julie's found us. Jan.14-16 in Bangkok for our first nights in this metropolis. Jan.16-20 in the Phangna region north of Phuket for some scuba diving and rain forest hikes. Jan.20-23 flying home via BKK, Singapore, Tokyo and Vancouver. When we first started planning this trip, we were torn between focusing on places that we liked the last time we were through SE Asia, and discovering new places and seeing new things. The latter option has won the day. We're no longer going to spend a week on the idyllic island of Phuket, Thailand. Rather, we're aiming for a small little island near Burma called Koh Phayam. That's after we spend a week or so in Cambodia, exploring Phnom Penh and the temples of Angkor Wat. In the early stages of planning I was relishing the thought of kicking back on the southern coast of Cambodia down near Kep - but as details got worked out, that dream was dashed due to lack of time. Nuts. But we are rendezvous'ing with another couple from Winnipeg in PP. And that shall be exciting to travel with some friends - sort of a first for us. 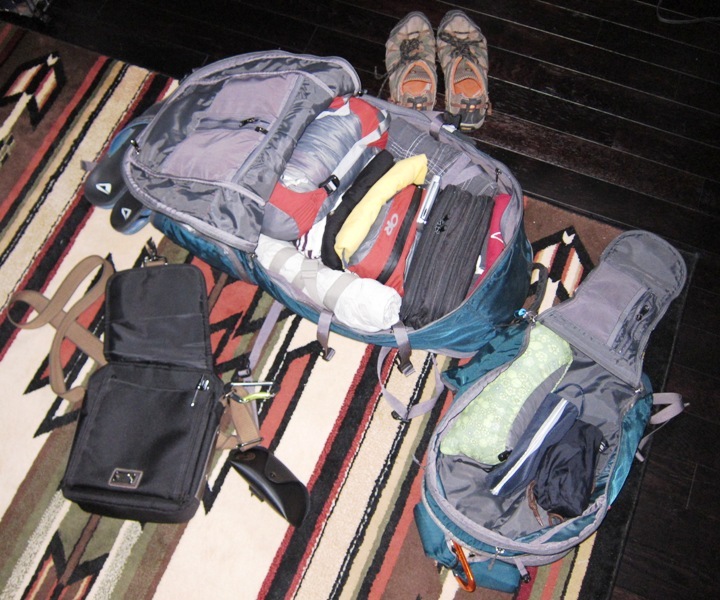 What to pack for such a trip? A vast assortment of gizmos, from two cameras to a tablet pc to a blackberry. This time I've splurged on fancy Exofficio underwear that reportedly can be worn and washed nightly. Fancy stuff. 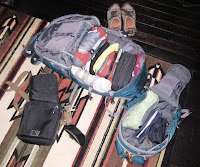 Our friends managed to only pack carry-on for their trip - I am amazed at their talents. It's 3 hours till airport time in Winnipeg. The strange thing is...it hasn't sunk in yet. Yet I'm sure it'll be a mad dash to the finish line to get everything sorted! Julie and Andrew travel round the world (RTW) for 11 months chasing summer. Join us through our blog. Basic itinerary is Winnipeg to Istanbul for 2 weeks. Beijing for 1 week and then to Hong Kong. Oct-Dec we travel through SE Asia (Vietnam, Thailand, Malaysia, Indonesia). December sees us spending Christmas in Australia, then New Years in New Zealand where we will live and work for 6 months. Last stop is South America (Ecuador) in June. We plan to return home in July 2009. Yep, and we're still faring well with the carry on travels! No problems thus far.